A truly unique ring is our IGNITUS tungsten wedding band as it is deceptively odd in its appearance. 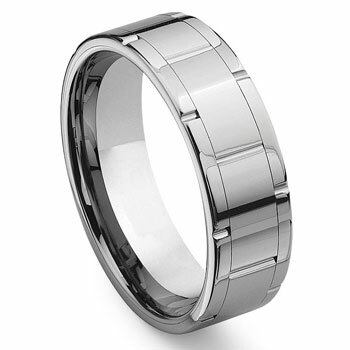 Made of high polish tungsten, and a styling effect that makes it seem the ring is separated at several sections of the top surface of the wedding band. However the ring is created this way while retaining the structural integrity. Tungsten is one of the hardest metals on earth and as such there is never a fear of the ring breaking or cracking. The IGNITUS tungsten wedding band is not only a great ring for someone getting married, but would also make a splendid gift any time of the year and to mark almost any special occasion. TitaniumKay.com is a Google Trusted Store and a safe secure shopping website. We offer a 100% lifetime warranty on all of the jewelry we sell including pieces with gemstones or natural stones as well. Rating: 4.8 / 5 , based on 11 reviews. This was my third purchase through Titanium Kay. I love the "simplicity" of the ring as it doesn't stand out too much and I still get numerous compliments regardless. Love the design as well. Good fit, comfortable and not too lose or tight. Thank you for the great experience of shopping with Titanium Kay.. will be putting my friends on to this site.. Thank you very much for my ring! It came right on time for my wedding and I'm proudly wearing it right now! Great service!!! The ring was better than expected. The picture on the site is exactly the same as the ring. I would buy from Titanium Kay again, the order was shipped the same day as ordered and was here in Canada within the week. Great company to deal with. Quick service, received it in 5 days. I actually lost a pervious ring I had purchased from Kay and I wouldn't go anywhere else. Ring is beautiful and receiving lots of compliments. Thank you for get service and awesome workmanship. I love the ring, (ignitus tungsten carbide wedding band ring). I love it's shine and the fact that it doesn't scratch. I think it's very masculine. I give this ring two thumbs up. The ring is great and the company was great to do business with. I will do business in the future with this company. Although I returned the ring, I was really impressed with the quality. I returned it because I wasn't very happy with the depth of the grooves as they looked a lot deeper online than they did in person. I'm also not sure I like the Comfort Fit. Everything I expected and more. Both I and my husband love this ring. He gets tons of compliments on it. Love the width and the weight of the ring and we certainly couldn't get anything better for the price. Thanks Titanium Kay!